William Kanengiser Concert in Monterey! World-renown guitar soloist and member of the L.A. Guitar Quartet, William Kanengiser, is performing a live concert right here in Monterey, and Hill Guitar wants you there! or at the door the evening of October 11th. Tickets are $25 for non-CCGS members and $20 for CCGS members. 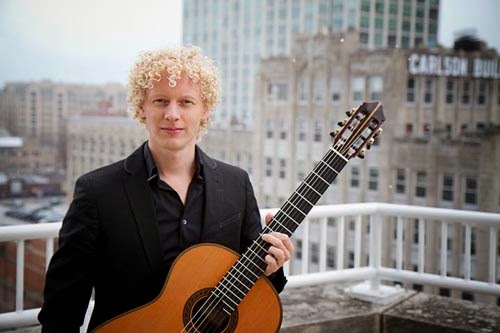 William Kanengiser is a Grammy Award-winning classical guitarist. 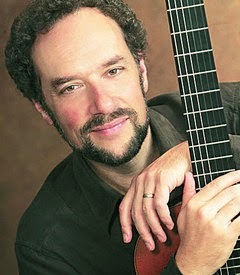 He is one of the founding members of the Los Angeles Guitar Quartet (LAGQ). Kanengiser holds a Bachelor of Music and Master of Music from the Thornton School of Music at the University of Southern California, where he also serves as a faculty member. Kanengiser has won Grammy Awards with the LAGQ, which received the award for best classical crossover album at the 47th Grammy Awards for Guitar Heroes; he has also won for his contribution to Atlanta Symphony Orchestra's performance of Golijov's Ainadamar: Fountain Of Tears, which won the Grammy Award for Best Opera Recording in 2007. This will be an evening to remember, buy tickets now! 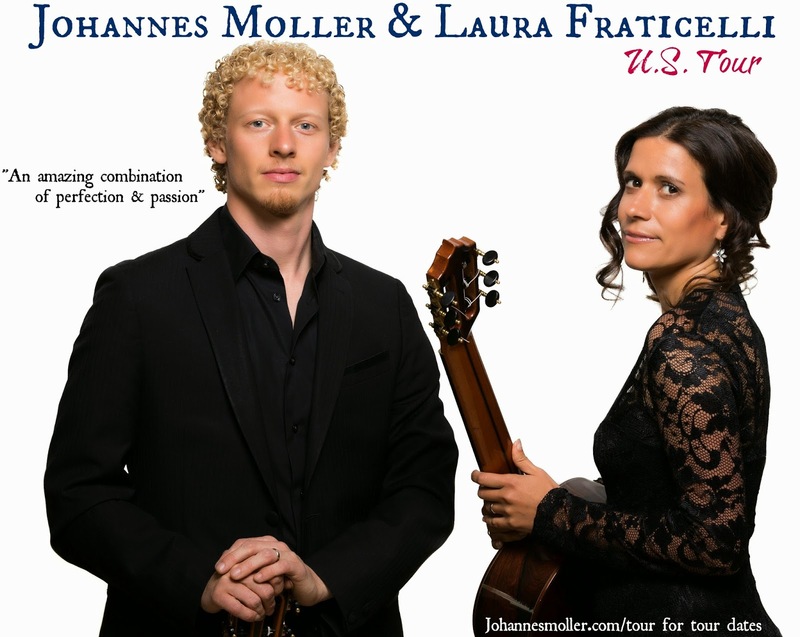 Johannes Moller & Laura Fraticelli Guitar Duo Coming to the U.S.! Have you heard the news? 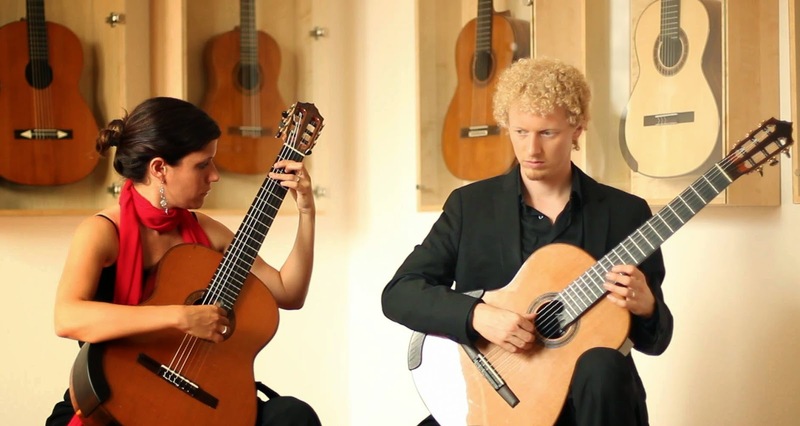 Johannes Moller and Laura Fraticelli Guitar Duo are coming to tour in the U.S.! They are promoting the upcoming release of their new album "Mertz: Guitar Duets" which is due out on Itunes on October 7th, 2014. They will be performing in Texas and Alabama. Listed below are the tour dates and where to get the tickets. September 27th: Blanco Performing Arts Center in Blanco, TX. September 28th: Colonial Hills United Methodist Church in San Antonio, TX. October 5th: Mount Vernon Music in Mt. Vernon, TX. October 6th: Outreach Performance in Mt. Vernon, TX. October 8th: Austin Guitar Salon at the Pfeiffer Home in Austin, TX. October 9th: Classical Cactus in Austin, TX. October 15th: Laidlaw Performing Arts Center in Mobile, AL. October 16th: Northwest Florida State University in Niceville, FL. October 19th: Christ The King Episcopal Church in Santa Rosa Beach, FL. Johannes Moller Hill Guitar for Sale! Are you a fan of Johannes Moller? Do you love his Hill Guitar that he gets his beautiful sound from? Then we have great news! He is selling one of his Hill Guitars! It is his 2012 Hill Signature Doubletop! He has played it all over the world for about 2 years and has had great success with it. However, he is parting ways with it and we want you to know! Johannes Möller for 2 years. This is a beautiful guitar and if you are a fan of the guitar itself or a fan of Johannes, this is the perfect fit for you! Selling for $7,500. Visit the Hill Guitar Website for more info. September 27th: Blanco Performing Arts Center in Blanco,TX. September 28th: San Antonio, TX. October 8th: Classical Cactus in Austin, TX. October 9th: Austin Guitar Salon in Austin, TX. October 16th: Northwest Florida State College in Niceville, FL. You will most likely need to purchase tickets through the venue. Moller-Fraticelli Guitar Duo playing at Siccas Guitars, Germany. Meet our new friends over at Siccas Guitars in Germany! 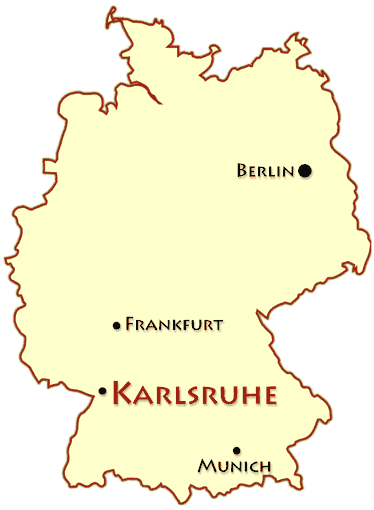 The location of Karlsruhe, Germany. 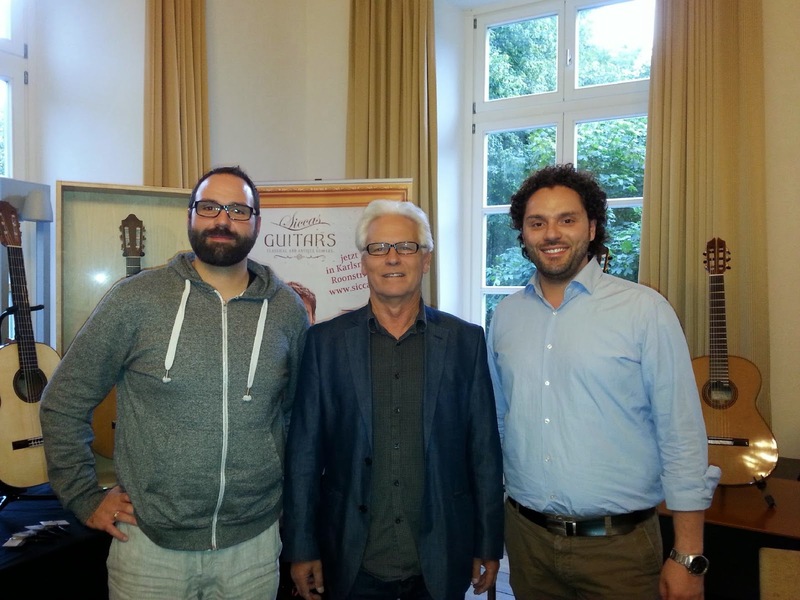 On my recent trip to the Iserlohn Guitar Symposium to show guitars, I had the good fortune to be set up right next to the exhibit of Siccas, a classical guitar dealing business from Karlsruhe, Germany. From the first few minutes of meeting them I had a very good feeling about the guys and about the company, and as we hung out for 4 more days it turned out really nice. The two men representing the company are Mirco Sicca and Manuel Luchena. I liked them both from first meeting, and as I got to know them I recognized good business skills, love for the guitars and the work, and great attitude. They seemed to have as good a time as I did at the festival, and I think it was eye opening for them as to the high level of accomplishment and passion of classical guitar players there. Kenny Hill with Mirco Sicca & Manuel Luchena. Most of the other exhibitors at the festival were individual guitar makers showing their own work. 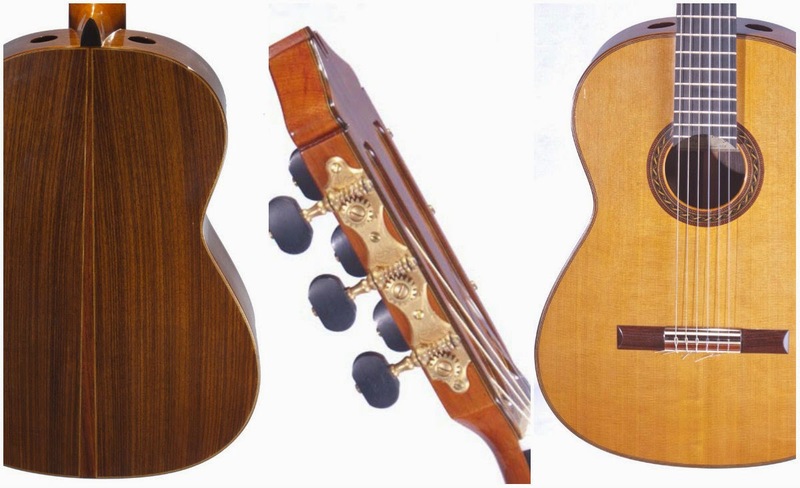 Siccas is different, they are a business selling concert level nylon string guitars from contemporary guitar makers, and also dealing in historic and collectible guitars. In their display and inventory they have a number of contemporary European guitar makers, and they also had a 1912 Herman Hauser, a 1929 Esteso, an 1840 Lacote, and a Daniel Friedrich, maybe some other secret stash, all available for people to try out. This is of course a big draw. And all the instruments — new and old — are for sale. Laura Fraticelli and Johannes Moller playing at Siccas. Watch here. years and seem to have found a good niche and are doing quite well. Siccas is now carrying my guitars, they have two Signature and one Performance model in stock. This is good for me, I have many fine artists playing my guitars in Europe, and in Germany in particular, and I've never had a reliable outlet. Now interested players can visit or contact Siccas and see what happens. I feel good about having my guitars available in Germany and the rest of Europe. Although there is a long history and deep tradition of classical guitar there and many fine builders, my guitars are different, and I would like to think fresh, nice, and a new and somewhat different option to traditional choices. I hope there is room for that. Please check out their website and especially if you are in Europe visit them or contact them. If your experience is anything like mine, you'll be glad you did. Although I didn't have time to visit their shop this trip, I hope to do so next time i'm in Europe, probably March or April 2015. See you there? Take a look around at Siccas Guitars!